Parapharyngeal space tumor manifesting as an oropharyngeal mass. Neurofibromas, in contrast, are unencapsulated and intimately involved with the nerve of origin. Neurofibromas are often multiple. They may occur as a manifestation of the neurofibromatosis-1 (NF-1) syndrome, a disease in which the incidence of malignant transformation is increased. The nerve of origin is usually sacrificed during excision to ensure complete removal of the neoplasm. A variety of more unusual lesions may occur in the PPS, and these lesions make up 10-15% of PPS masses. [2, 19] While the pathologist usually makes the final determination and diagnosis in such cases, recognizing that vascular lesions, such as hemangiomas, arteriovenous malformations, and internal carotid artery aneurysms, may occur in the PPS is important. Imaging studies of this region must be performed before attempting to obtain a biopsy or to excise the lesion. Patients with tumors of the parapharyngeal space (PPS) most commonly present with a neck or oropharyngeal mass that does not cause symptoms detectable on physical examination, because only the inferior and medial boundaries of the PPS are distensible, as seen in the images below. Parapharyngeal space tumor manifesting as a neck mass. Tumors are usually at least 2 cm in size before the bulge or abnormality is palpable. Often, a PPS lesion is discovered incidentally on routine physical examination. Unilateral eustachian tube dysfunction may result from significant medial extension, causing soft palate and nasopharyngeal swelling. Oropharyngeal bulging from an underlying PPS mass may cause significant displacement of the ipsilateral tonsil and may create the appearance of a primary tonsillar lesion. An ill-fitting denture may be the first symptom of a benign prestyloid lesion. Symptoms of dysphagia, dyspnea, and obstructive sleep apnea may result from distortion of the lateral pharyngeal wall by a massive PPS lesion. [4, 8] In such cases, tracheostomy has been recommended for relief of airway obstruction. Physical examination findings may suggest the origin and nature of the tumor. The most common physical finding is a painless oropharyngeal or neck mass. Pay careful attention to the oropharynx, tonsillar area, pharynx, and neck. 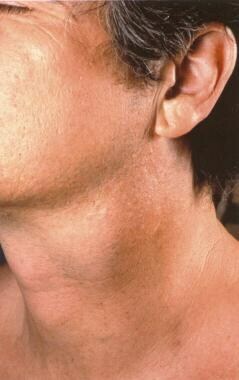 Lesions arising from the deep lobe of the parotid may often be localized using bimanual palpation. Perform a full cranial nerve evaluation, including laryngoscopy, to test the motor and sensory innervation of the larynx. The vagus nerve is the most commonly involved cranial nerve, and vagal palsy is suggestive of either a paraganglioma or a malignancy. Complete surgical excision is the mainstay of treatment and is recommended for both diagnostic and therapeutic purposes. The choice of surgical approach is dictated by the size of the tumor, its location, its relationship to the great vessels, and the suspicion of malignancy (see Surgical therapy). However, when surgery is contraindicated, alternatives to surgical therapy consist of observation or radiation therapy. The parapharyngeal space (PPS) is a potential space lateral to the upper pharynx. The PPS is shaped like an inverted pyramid, extending from the skull base superiorly to the greater cornu of the hyoid bone inferiorly. The superior border of the PPS comprises a small area of the temporal and sphenoid bones, including the carotid canal, jugular foramen, and hypoglossal foramen. The PPS is limited anteriorly by the pterygomandibular raphe and pterygoid fascia and posteriorly by the cervical vertebrae and prevertebral muscles. The medial border of the PPS is the pharynx, and the lateral border is comprised of the ramus of the mandible, the medial pterygoid muscle, and the deep lobe of the parotid gland. Below the level of the mandible, the lateral boundary consists of the fascia overlying the posterior belly of the digastric muscle. The fascia from the styloid process to the tensor veli palatini divides the PPS into an anteromedial compartment (ie, prestyloid) and a posterolateral (ie, poststyloid) compartment. The prestyloid compartment contains the retromandibular portion of the deep lobe of the parotid gland, adipose tissue, and lymph nodes associated with the parotid gland. The poststyloid compartment contains the internal carotid artery, the internal jugular vein, CNs IX-XII, the sympathetic chain, and lymph nodes. These lymphatics receive afferent drainage from the oral cavity, oropharynx, paranasal sinuses, and thyroid. The distinction between the prestyloid and poststyloid space is more than just semantic because imaging studies can delineate between the two compartments and can assist in reaching the correct diagnosis preoperatively. Surgery may be contraindicated and nonoperative management of parapharyngeal space (PPS) lesions considered for patients who are poor surgical candidates because of comorbid disease; those who are elderly; those in whom balloon occlusion fails; those who have unresectable lesions; and those who have benign, slow-growing tumors that would carry a significant risk of sacrifice of multiple cranial nerves if resected. The risks and benefits of surgery must be weighed in every case. Suarez-Fente V, Llorente-Pendas JL, Gomez-Martinez J, Garcia-Gonzalez LA, Lopez-Alvarez F, Suarez-Nieto C. [Primary tumours of the parapharyngeal space. Our experience in 51 patients.]. Acta Otorrinolaringol Esp. 2009 Jan. 60(1):19-24. [Medline]. Riffat F, Dwivedi RC, Palme C, et al. A systematic review of 1143 parapharyngeal space tumors reported over 20 years. Oral Oncol. 2014 May. 50(5):421-30. [Medline]. Batsakis JG, Sneige N. Parapharyngeal and retropharyngeal space diseases. Ann Otol Rhinol Laryngol. 1989 Apr. 98(4 Pt 1):320-1. [Medline]. Carrau RL, Myers EN, Johnson JT. Management of tumors arising in the parapharyngeal space. Laryngoscope. 1990 Jun. 100(6):583-9. [Medline]. Cohen SM, Burkey BB, Netterville JL. Surgical management of parapharyngeal space masses. Head Neck. 2005 Aug. 27(8):669-75. [Medline]. Olsen KD. Tumors and surgery of the parapharyngeal space. Laryngoscope. 1994 May. 104(5 Pt 2 Suppl 63):1-28. [Medline]. Curtin HD. Separation of the masticator space from the parapharyngeal space. Radiology. 1987 Apr. 163(1):195-204. [Medline]. Som PM, Biller HF, Lawson W, Sacher M, Lanzieri CF. Parapharyngeal space masses: an updated protocol based upon 104 cases. Radiology. 1984 Oct. 153 (1):149-56. [Medline]. Spiro RH. Salivary neoplasms: overview of a 35-year experience with 2,807 patients. Head Neck Surg. 1986 Jan-Feb. 8 (3):177-84. [Medline]. Saito DM, Glastonbury CM, El-Sayed IH, Eisele DW. Parapharyngeal space schwannomas: preoperative imaging determination of the nerve of origin. Arch Otolaryngol Head Neck Surg. 2007 Jul. 133(7):662-7. [Medline]. Leonetti JP, Donzelli JJ, Littooy FN, Farrell BP. Perioperative strategies in the management of carotid body tumors. Otolaryngol Head Neck Surg. 1997 Jul. 117(1):111-5. [Medline]. Urquhart AC, Johnson JT, Myers EN, Schechter GL. Glomus vagale: paraganglioma of the vagus nerve. Laryngoscope. 1994 Apr. 104(4):440-5. [Medline]. Baysal BE, Farr JE, Rubinstein WS, et al. Fine mapping of an imprinted gene for familial nonchromaffin paragangliomas, on chromosome 11q23. Am J Hum Genet. 1997 Jan. 60(1):121-32. [Medline]. McCaffrey TV, Meyer FB, Michels VV, Piepgras DG, Marion MS. Familial paragangliomas of the head and neck. Arch Otolaryngol Head Neck Surg. 1994 Nov. 120(11):1211-6. [Medline]. Schwaber MK, Glasscock ME, Nissen AJ, Jackson CG, Smith PG. Diagnosis and management of catecholamine secreting glomus tumors. Laryngoscope. 1984 Aug. 94(8):1008-15. [Medline]. Manolidis S, Shohet JA, Jackson CG, Glasscock ME 3rd. Malignant glomus tumors. Laryngoscope. 1999 Jan. 109 (1):30-4. [Medline]. Lack EE, Cubilla AL, Woodruff JM, Farr HW. Paragangliomas of the head and neck region: a clinical study of 69 patients. Cancer. 1977 Feb. 39 (2):397-409. [Medline]. [Full Text]. Gaylis H, Davidge-Pitts K, Pantanowitz D. Carotid body tumours. A review of 52 cases. S Afr Med J. 1987 Oct 3. 72 (7):493-6. [Medline]. Pensak ML, Gluckman JL, Shumrick KA. Parapharyngeal space tumors: an algorithm for evaluation and management. Laryngoscope. 1994 Sep. 104(9):1170-3. [Medline]. Langerman A, Rangarajan SV, Athavale SM, Pham MQ, Sinard RJ, Netterville JL. Tumors of the cervical sympathetic chain-Diagnosis and management. Head Neck. 2012 Sep 24. [Medline]. Som PM, Biller HF, Lawson W. Tumors of the parapharyngeal space: preoperative evaluation, diagnosis and surgical approaches. Ann Otol Rhinol Laryngol Suppl. 1981 Jan-Feb. 90(1 Pt 4):3-15. [Medline]. Som PM, Curtin HD. Lesions of the parapharyngeal space. Role of MR imaging. Otolaryngol Clin North Am. 1995 Jun. 28(3):515-42. [Medline]. Pitman KT, Weissman JL, Johnson JT. The parapharyngeal space: diagnosis and management of commonly encountered entities. Self-instructional package (SIPac). 3rd ed. Rochester, NY: The American Academy of Otolaryngology-Head and Neck Surgery Foundation; 1998. 1-66. Hamza A, Fagan JJ, Weissman JL, Myers EN. Neurilemomas of the parapharyngeal space. Arch Otolaryngol Head Neck Surg. 1997 Jun. 123(6):622-6. [Medline]. Maxwell JE, Howe JR. Imaging in neuroendocrine tumors: an update for the clinician. Int J Endocr Oncol. 2015. 2 (2):159-168. [Medline]. [Full Text]. Hu K, Persky MS. The multidisciplinary management of paragangliomas of the head and neck, Part 2. Oncology (Williston Park). 2003 Aug. 17 (8):1143-53; discussion 1154, 1158, 1161. [Medline]. Langerman A, Athavale SM, Rangarajan SV, Sinard RJ, Netterville JL. Natural history of cervical paragangliomas: outcomes of observation of 43 patients. Arch Otolaryngol Head Neck Surg. 2012 Apr. 138 (4):341-5. [Medline]. Eisele DE, Netterville JL, Hoffman HT, Gantz BJ. Parapharyngeal space masses. Head Neck. 1999 Mar. 21(2):154-9. [Medline]. Prasad SC, Piccirillo E, Chovanec M, et al. Lateral skull base approaches in the management of benign parapharyngeal space tumors. Auris Nasus Larynx. 2014 Sep 27. [Medline]. Chan JY, Tsang RK, Eisele DW, Richmon JD. Transoral robotic surgery of the parapharyngeal space: a case series and systematic review. Head Neck. 2015 Feb. 37 (2):293-8. [Medline]. [Full Text]. O'Malley BW Jr, Quon H, Leonhardt FD, Chalian AA, Weinstein GS. Transoral robotic surgery for parapharyngeal space tumors. ORL J Otorhinolaryngol Relat Spec. 2010. 72 (6):332-6. [Medline]. Chang SS, Goldenberg D, Koch WM. Transcervical approach to benign parapharyngeal space tumors. Ann Otol Rhinol Laryngol. 2012 Sep. 121(9):620-4. [Medline]. Hughes KV 3rd, Olsen KD, McCaffrey TV. Parapharyngeal space neoplasms. Head Neck. 1995 Mar-Apr. 17(2):124-30. [Medline]. Christopoulos E, Carrau R, Segas J, Johnson JT, Myers EN, Wagner RL. Transmandibular approaches to the oral cavity and oropharynx. A functional assessment. Arch Otolaryngol Head Neck Surg. 1992 Nov. 118(11):1164-7. [Medline]. Cassoni A, Terenzi V, Della Monaca M, et al. Parapharyngeal space benign tumours: our experience. J Craniomaxillofac Surg. 2014 Mar. 42 (2):101-5. [Medline]. Linkov G, Morris LG, Shah JP, Kraus DH. 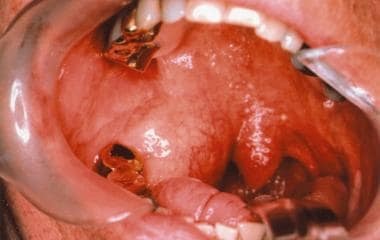 First bite syndrome: incidence, risk factors, treatment, and outcomes. Laryngoscope. 2012 Aug. 122 (8):1773-8. [Medline]. Chiu AG, Cohen JI, Burningham AR, Andersen PE, Davidson BJ. First bite syndrome: a complication of surgery involving the parapharyngeal space. Head Neck. 2002 Nov. 24 (11):996-9. [Medline]. Witt RL. The significance of the margin in parotid surgery for pleomorphic adenoma. Laryngoscope. 2002 Dec. 112 (12):2141-54. [Medline]. Duek I, Amit M, Sviri GE, Gil Z. Combined endoscopic transcervical-transoral robotic approach for resection of parapharyngeal space tumors. Head Neck. 2017 Apr. 39 (4):786-90. [Medline]. Fan S, Lin SG, Zhang HQ, et al. A comparative study of the endoscopy-assisted transoral approach versus external approaches for the resection of large benign parapharyngeal space tumors. Oral Surg Oral Med Oral Pathol Oral Radiol. 2017 Feb. 123 (2):157-62. [Medline]. Goldenberg D, Ondik MP. DaVinci robot-assisted transcervical excision of a parapharyngeal space tumor. J Robot Surg. 2010 Sep. 4 (3):197-9. [Medline]. CT scan of prestyloid space mass. The lesion causes medial displacement of the parapharyngeal fat pad and represents a benign salivary gland tumor. T2-weighted MRI of a prestyloid space mass. This mass is confluent with the deep lobe of the parotid gland; the parapharyngeal fat pad is displaced medially. These findings are consistent with an origin from the deep lobe of the parotid. CT scan of a poststyloid space mass. Note the anterior and lateral displacement of the parapharyngeal fat, characteristic of poststyloid lesions. This lesion enhances and proved to represent a carotid body tumor. MRI of a poststyloid mass. Note anterior displacement of the parapharyngeal fat and multiple flow voids within the tumor itself, consistent with a diagnosis of paraganglioma. Angiogram of carotid body tumor. These are found between the carotid bifurcation and cause splaying of the internal carotid artery and external carotid artery resulting in the lyre sign. Angiogram of glomus vagale tumor. Because the vagus nerve lies laterally and posteriorly to the carotid system, these appear as vascular lesions displacing the internal carotid artery and external carotid artery anteriorly and medially.